I think that "Into The Pit" does describe what happened last night while I was watching TESTAMENT on stage in the near front row. I lost my glasses when stage-diver (not a LOVE LIVER) suddenly climbed my back to the top of my head to surf the crowd to the stage. Anyway, it was an awesome show. 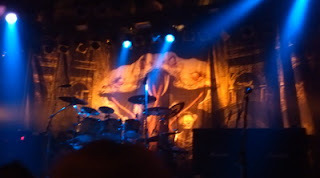 The show started with the title track of the new album, Brotherhood of the Snake. 90 minutes of pure thrash metal. Among others, songs from The Legacy, The New Order, and Practice What You Preach albums really takes me back. Singing along part of Alone In The Dark made me realize that good melody is a part of TESTAMENT. That's real fantastic.